HUNDREDS of Nigerians, under the aegis of Coalition of Civil Society Organisations, on Monday, protested against the prolonged absence of President Muhammadu Buhari from the country. The protesters, who converged under the platform of the Civil Society Coalition and the “Our Mumu Don Do” advocacy groups, were led on the street protest by maverick musician, Charles Oputa (aka Charly Boy). 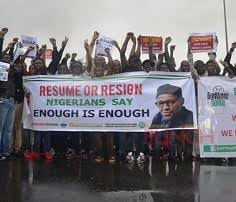 The protesters stormed the streets of Abuja and demanded that the president either resigned of returned to the country. The groups defied the early morning rain and converged on the Unity Fountain Close to the Transcorp Hilton Hotel, from where they marched on the Shehu Shagari Way, towards the gate of the Presidential Villa. Charly Boy and a former Director of New Media at the national headquarters of the Peoples Democratic Party (PDP), Deji Adeyanju, addressed the crowd of protesters, saying that Buhari’s absence in more than 90 days was unacceptable. Adeyanju said the handlers of President Buhari must tell the truth about his health, adding that if the president could not continue, he should resign to allow Osinbajo take over the ship of governance. Charly Boy said he supported the protest to demand that the right things be done, adding that he was concerned for the future of the younger generation which, he said, was bleak due to the way politicians were handling the country. He added that Nigerian youths had the responsibility to demand accountability and good leadership as well as the development of the country. The group was, however, unable to deliver their protest letter to Aso Rock, as security operatives blocked the way to the Villa. The protests held simultaneously in Nigeria and the Abuja House in London.